It’s easy to forget because we don’t charge for it that Marketing is a product too. In particular, online marketing is increasingly indistinguishable from an online software product. It has a User Experience that we want the consumer to be delighted with. It has Business Logic and is the System of Record for critical Enterprise Value if you want to get all Enterprise Software about it. Think about Marketing as a Product and you’ll find some breakthrough insights. And don’t assume you don’t charge for marketing either. You’re charging your customers the highest price they pay for anything you sell–you’re asking them to give you their trust. If we’re going to think about Marketing as a Product, then the concept of Minimum Viable Product makes a lot of sense for Marketers to think about as well. MVP is all about the idea of not building in every possible feature and refinement. It’s about building as little as possible to make a product that you can get in front of customers sooner, so you can learn from their feedback. Doesn’t that sound exactly like what marketers should be doing to avoid making mistakes that were tragically knowable? We’ve got 4 to 8x the volume from the non-social and only a 50% better conversion. Reminds me of Bing. I get much better conversion from Bing searchers–makes me think it may be a better engine. But so many fewer show up than Google that it doesn’t matter. Someone else raises the issue that the cost of getting the different kinds of visitors affects the ROI and therefore may change the picture. But as I say, we have an inventory problem (potentially). If I can only get x conversions from Social Media and that number is sufficiently low, that’s the inventory available for marketing dollars in this kind of program and it doesn’t matter what the cost is unless it is to make the program even less attractive (e.g. 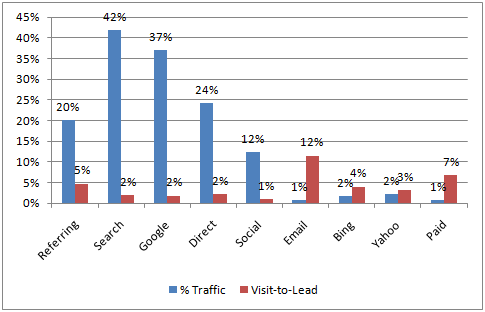 if there are too few leads AND they’re very expensive, we really don’t like this kind of spend). Last aside, they talk about conversion to leads, but that isn’t conversion to revenue. I have also remarked and believe that optimizing the wrong metric is the root of all marketing evil, so we may have been led down a primrose path on that one (though the $ money bags on the chart are a tacky misdirection if so, LOL). What we want to optimize, in other words, is not leads but actual sales. Marketing and Sales departments fight like cats and dogs over that one all day every day at nearly every company. What does all this have to do with a Minimum Viable Marketing Strategy? It’s a perfect example of why you need one–to avoid the distraction of programs that can’t produce enough results to make a difference even if the results that are produced may be good and cheap. Put another way, when you are small, one more good, cheap, but relatively insignificant marketing program is just like one more good, cheap, but relatively unimportant feature on a product. You don’t need the distraction, shouldn’t spend the time and money, and it won’t move the needle. Cross it off the list until you are much bigger. You’re looking for big hits. Test as many small ones as you can until you find the big ones and then double down. These numbers, at least what we have so far, don’t make Social Media look like a big hit for the business as described. We can see that Social is generating quite a lot (15%) of the traffic to the site. However, its conversion to leads is just the opposite of Hubspot’s numbers, being lower than many other sources. Being a heavy content marketer, I’m of the opinion (unproven), that getting so many visitors is worthwhile and I will eventually nurture them to conversion. In addition, I suspect referring sites link to me partially because of my content and partially because I have a following on the social communities peculiar to this space. For example, I know a lot of machinists through the social who may then go on to connect. FWIW, while I have tried Facebook, Twitter, and LinkedIn, and maintain presences on Facebook and Twitter for CNCCookbook, these are very poor sources of leads and visitors. The richest sources are niche communities totally focused on the market CNCCookbook is in. Here is the more interesting thing to consider, though. If you’re looking for the minimum viable marketing strategy for the CNCCookbook business, which programs should you focus on? Which should you ignore? FWIW, I have sorted the data series in order of most to fewest leads produced. For example, the Paid category (largely Google AdWords) has a very high conversion, but doesn’t yield enough leads. I spent months tuning it until I was only paying for clicks that actually yielded profitable business. That mostly resulted in long tail keywords, which are cheaper to bid for than mainstream more generic keywords. Unfortunately, they have an inventory problem–not enough long tail searches with profitable economics. Will I keep running the AdWords campaign? Yes, the work spent tuning is sunk cost. But I won’t spend more time trying to improve AdWords other than to monitor that the ROI stays profitable and cut it back when it doesn’t. In retrospect it wasn’t worth the amount of time I spent on it and shouldn’t have been part of the minimum viable marketing strategy for CNCCookbook. For this business, the cutoff is after email. It isn’t worth focusing on Bing (and I definitely wouldn’t buy ads there) or PPC. My email is worthwhile, largely because it is low effort and consists mainly of periodically asking my customer base to refer their friends (hence the very high visit to lead ratio). What I should do next is find some more things to test, and that’s what I’m doing. Keep in mind, your mileage not only can but will vary–you have to test, test, test to know what works and what doesn’t. Double down on what works, cut what doesn’t, and keep some powder dry to keep testing new things. Cast your net wide and don’t get focused on going deep except in a very few areas that are well proven. Small Businesses should look for a Minimum Viable Marketing strategy. Don’t get distracted (as I did) trying to optimize programs that can’t possibly produce the results you need. Run some tests and ask yourself how much improvement you would need to see in those tests before a program would be in your top 3 or 4. PPC was never going to get there for me, so I never should’ve invested in improving those results. It would’ve required hundreds of percent improvement, and I had proven viable programs already doing much better. Focus on those and keep enough bandwidth to keep testing new possibilities.